When I was very young (4?) my dad and I traveled a lot by car across Texas. He had leased a bunch of scales (the kind where you put in a nickel and get your weight and fortune told.) We had to travel around to all the greasy spoons in West Texas where he had placed these scales, so he could collect the nickels. I could already read by then, and my dad set out to teach me to be his navigator. 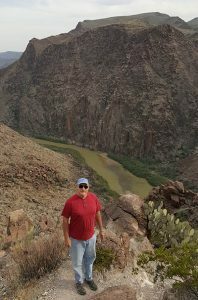 When I first spied the Big Bend area on the map, and many times in subsequent trips, I begged him to take me there. That never happened, and he died a few years later. I have had it on my bucket list to go there ever since. 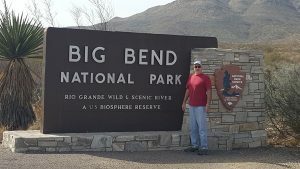 For the first time in my life, we were traveling across Texas and not in a powerful hurry to be somewhere specific on a deadline, so we slotted out a couple of days to visit Big Bend. What a beautiful, rugged, wild place it is! Apart from a couple of tiny villages there was no cell service whatsoever or we would have parked someplace for a few days and worked. So we just buzzed through. Sometimes, a bucket list item doesn’t take as long as one would actually like. Marie and I are always on the lookout for places where we might want to settle down when we get tired of roaming. At one point in the middle of miles of mesquite scrub and creosote bush, we saw a sign saying that a little two-horse ranch was for sale. If you take Highway 385 south from Marathon, you’ll get to the Big Bend National Park in about 40 miles. Then you just keep going and going and hang a right on 118 when 385 gives up the ghost. That takes you through the national park to Terlingua. There’s only one chance in that little village to get something cold to drink, so don’t blink. Leaving fair Terlingua, there’s a Caution sign saying “15 Percent Grade – 30 miles”. It’s not a mistake, although I am pretty sure that there’s more than one steep grade that qualifies. Next up was Big Bend Ranch State Park, which had the most up and down and twisty roads we’ve been on so far in our entire journey across the country, up the east coast, and back. Even more so than the Blue Ridge Parkway. 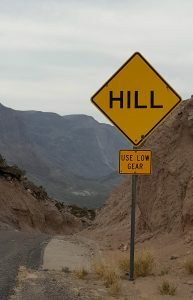 Maybe halfway between Terlingua and Presidio, lies the big hill. What the sign didn’t convey is that it’s Fifteen Percent Grade, both up the hill and then down the other side. Our diesel chugged valiantly through a mile or two of that unbelievably steep grade to the top, where we parked for a while to let the engine cool off. We climbed around on the rocks until Marie could line things up to take that photo of me above with the river behind and below. Very, very below. Then we climbed back aboard, put it in low gear, mumbled a little prayer to the Blessed Virgin, made the sign of the cross, crossed our fingers, rubbed our rabbit’s foot, knocked on wood, thought some good thoughts, and headed down. I’m not sure what worked, but we made it to the bottom without going into the river or burning out our brakes.